eG Innovations has received two patents for its virtualization monitoring and root-cause diagnosis technologies. U.S. Patent 8,208,381 deals with automatic, virtualization-aware root-cause diagnosis of business service performance issues across network, system, application and virtualization tiers. U.S. Patent 8,209,684 deals with eG Innovations In-N-Out monitoring technology for virtual infrastructures that provides correlated outside and inside view of virtual machines. “eG Innovations has a long tradition of industry ‘firsts’ because of our strong commitment to innovation and helping customers overcome the challenges in performance management of dynamic IT environments,” said Srinivas Ramanathan, founder and CEO, eG Innovations. When users call and complain about slow applications, it is often difficult and very time consuming to pinpoint the root cause of the problem with accuracy. Is it the network, Citrix, VMware, is it the Java application, database server, or storage, is it the network or is there a problem in the cloud? Is it user behavior or application problems? 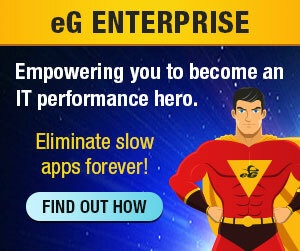 eG Enterprise, the flagship product suite from eG Innovations, is the only solution that automates and dramatically accelerates the discovery, diagnosis and resolution of performance issues – across virtual, physical and cloud environments. This way IT staff can resolve performance issues with accuracy in minutes rather than days or weeks, and highly skilled IT staff can be more productive rather than fighting fires all day. Virtualized IT environments are highly dynamic and heterogeneous, making manual performance diagnosis with legacy tools virtually impossible. eG’s unique, patented In-N-Out technology delivers both depth and breadth of insight into virtual application performance, a critical capability for rapid and accurate diagnosis of performance problems. It is the only application performance management solution that provides both an outside view of a VM indicating the hypervisor’s physical resources used by a VM, and an inside view of the VM indicating which application(s) and user(s) of the VM are causing the resource usage. This capability is particularly useful in virtual desktop infrastructures, where it is not possible to deploy monitoring agents on each and every virtual desktop, yet it is critical to understand what is happening inside each virtual desktop. Way to go eG! Two patents that were long overdue and very well deserved!